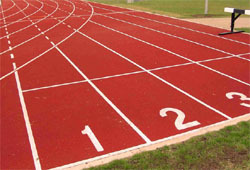 Although the club is better known for its marathon and road running exploits in recent times, Eagle AC has a long tradition in track & field also. Indeed many of the club’s early successes were in spikes with medalists in sprints and throws at various levels from county through to national level. Some of the club’s track & field exploits during its first 10 years in existence are detailed here and even include a 400m hurdles performance which still features on the Irish all-time list! Whether you are an existing club member interested in trying track & field events or a newcomer to the sport interested in representing Eagle A.C. in a track or field discipline, we would like to hear from you. Please contact us if you would like more information. 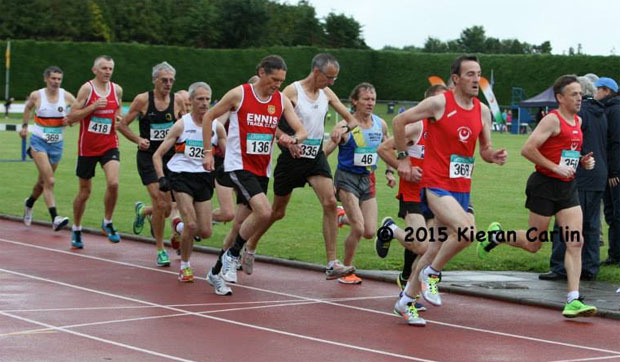 The 2015 Track & Field Season got off to a great start in January with two members travelling to Nenagh to participate in the Munster Masters Indoor Track & Field Championships. 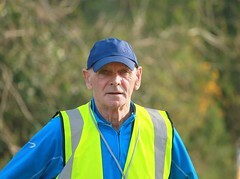 John Desmond’s report is available here . James Ryan took home a bronze medal in the M45 3,000m with a time of 11:31.87 and John Desmond’s 6.49m effort clinched bronze in the M50 shot put. 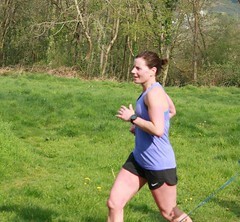 The outdoor season got underway with the John Buckley Sports Graded Track & Field League. For the first time in recent years, Eagle A.C. were represented by one or more athletes in each of the Rounds of the League. 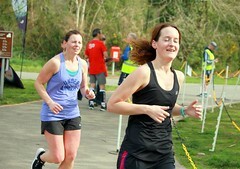 Club participants this year were Vivian Foley (Mile). 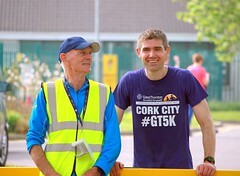 Kevin Geary (Mile, 1500m and 3000m), John Quigley (1500m), David O’Donovan (High Jump, Long Jump and 1500m), Keith Burke (400m), Damian Kenneally (1500m), Pat O’Connor (1500m), Donnacha Lehane (3000m), Shane O’Shaughnessy (800m), Pat Power (3000m) and Pat Murphy (800m). The highest grade of performance for the club on the track was Vivian’s 3.91 points in Round 1 of the League for his 5:09.44 Mile. 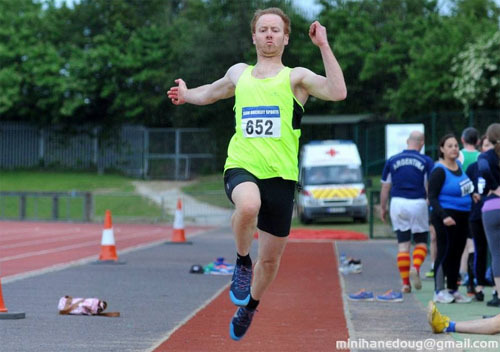 In the field events, David O’Donovan’s long jump of 4.68m in Round 4 of the League (pictured below) led the way for the club with a grade of 4.46 points. 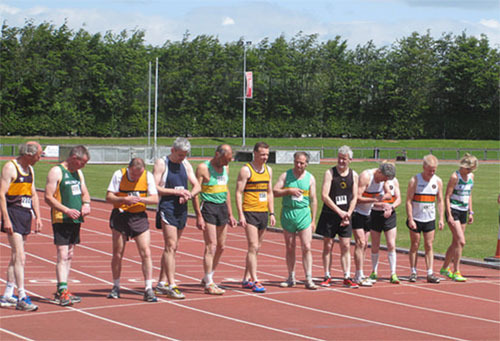 At the Cork County Masters Track & Field Championships in May, the club had some several podium performances. David O’Donovan collected three 2nd place finishes across various disciplines with a 2nd place in the M35 400m in a time of 64.81, a 2nd place in the Long Jump with a jump of 4.65m and a 2nd place finish in the High Jump with a clearance at 1.40m. Pat Murphy was 2nd in the M55 1500m in a time of 6:00.13. 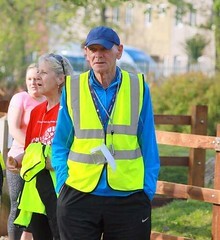 John Quigley (pictured below) finished 3rd in the M60 800m in a time of 3:22.27, 2nd in the M60 1500m in a time of 6:25.95 and 2nd in the M60 3000m in a time of 13:23.20. Richard Piotrowski (pictured below as the race gets underway) produced the club’s track & field performance of the year when he took gold in the M65 5,000m at the National Masters Track & Field Championships in a time of 19:19.1, over a minute and a half ahead of the 2nd placed finisher in his category. The final Eagle A.C. success on the track in 2015 was in the closing event of the John Buckley Sports Graded Track & Field League. An Eagle A.C. quartet of Keith Burke (400m), Damian Kenneally (200m), Donnacha Lehane (200m) and Shane O’Shaughnessy (800m) took the baton around in the medley relay in a time of 4:20.8 to finish in 1st place. 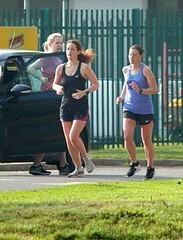 A race report of this event is available here. 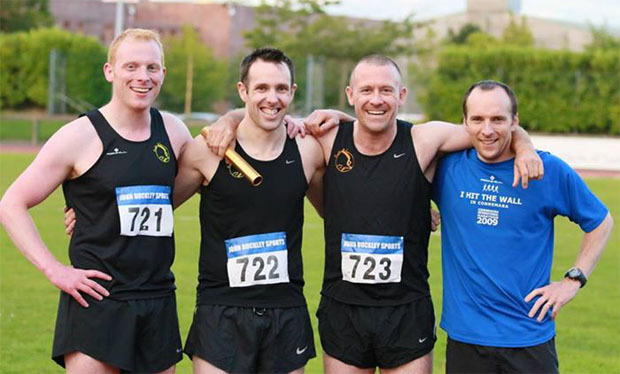 Pictured left to right: Keith Burke, Damian Kenneally, Shane O’Shaughnessy and Donnacha Lehane. 2015 showed some resurgence in the club’s track & field roots; let’s see what 2016 has in store!